I have curated a wee season of four films by one of the greatest, and most rarely screened, doc filmmakers, Shinsuke Ogawa, at the Sheffield doc/fest from 6-9 November this year. His best work was in the 70s. He moved in with his subjects for up to a decade. He made the first environmental protest films. Just thought I’d tell you cos when I did something similar last year, I got complaints that I didn’t tell people! The films are astonishing. The man is astonishing. If you are interested, I have pasted in my notes below. We about to go a huntin’ bear.” ~ a Wise Man. 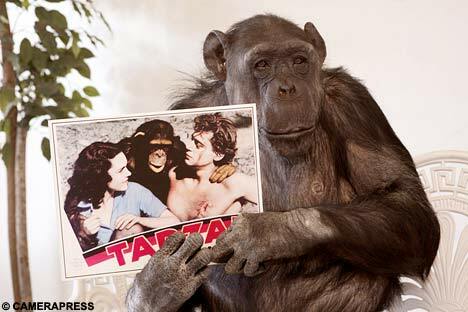 Cheeta the chimp (real name Jiggs) has not only written an autobiography, as reported here. He’s released a charity single. It’s a cover version of the theme from CONVOY. I thought about this until my brain prolapsed out my neck, and I finally figured it out. Cheeta — chimp — B.J. and the Bear (or EVERY WHICH WAY BUT LOOSE if you prefer) — trucks — CONVOY. But what we now require is a REMAKE of CONVOY with the septuagenarian chimp in the Kris Kristofferson role. Chimps in ALL the roles! Except Ernest Borgnine, we need him to reprise his part as the sheriff, to give the thing some dignity. “You know, on most movies you have some good days and some bad days. I don’t feel like I’ve had one single good day on this movie.” ~ Sam Peckinpah.